It's the stuff legends are made of -- hot beats, tight hooks, and a truckload of cannabis references from a do-it-yourself hip-hop crew. In Gonzalez v. Raich, 545 U.S. 1 (2005), the United States Supreme Court ruled that Congress could constitutionally regulate marijuana via federal law regardless of whether California law allowed residents to use the drug for medicinal purposes. The original plaintiffs in the case were two women using marijuana to treat their illnesses. Both were following the directions of licensed, board-certified physicians. After an investigation at the home of one of the litigants, county officials concluded her marijuana use was lawful under California law. Yet, federal agents still seized and destroyed her six cannabis plants after a three-hour standoff. True, they weren't exactly shutting down Nino Brown from New Jack City. But there's a bigger picture. After the Supreme Court's decision, I'm almost certain that experts everywhere were scrambling to answer the most crucial legal question of all: how would the Kottonmouth Kings respond? Supreme Court Justices might be appointed for life, but they don't sell records like rappers do, and when it comes to moving units, the Kottonmouths have earned the "King" title. They run Suburban Noize Records, through which they have marketed and distributed their own music as well as music from X-Clan, Jada Pinkett Smith's Wicked Wisdom, and Authority Zero. After being in the rap game for more than ten years, the Kottonmouth Kings have a clothing company and are releasing their eighth album called Koast II Koast. See? A hip-hop King has more clout than a Chief Justice any day of the week. More than that, the Kottonmouth Kings love weed. They've spread awareness about drug laws via a free interactive CD-Rom and participated in a protest of the Supreme Court's ruling. The National Organization for the Reform of Marijuana Laws (NORML) presented the Kottonmouth Kings with "The Golden Lung Freedom Fighter" Award, and High Times Magazine named them "Band of the Year" for 2006. And more than all of that, the Kottonmouth Kings are some scary looking dudes. 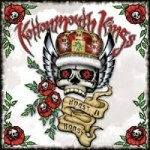 Peep the album cover for Koast II Koast, which greets the Kings' audience with a skull wearing a red and gold crown. Each corner of the cover is adorned by roses with little baby skulls in the center. It's as if the skeleton from the show Tales From the Crypt decided to produce a rap album. On the back and in the foldout poster, we find the Kottonmouth Kings -- D-Loc, Richter, Daddy X, Pakelika, DJ Bobby B, and Lou Dog -- posing in what appears to be a field of homegrown medicinal herbs. The lady from the suburbs on Showtime's Weeds -- yeah, the one who bakes marijuana brownies and weed muffins -- would love to take charge of that stash. Pakelika's got his face in a mask, D-Loc and Richter are sporting meticulously rendered tattoos, and Lou Dog (wildin' out in his fluffy afro) will actually be photographed eating leaves. Boy, oh boy, I would not want to be the law clerk at the Supreme Court who has to deal with these guys. The Gang of Nine should rule all federal laws unconstitutional and be done with it, thereby legalizing everything, at least briefly. Musically, the Kottonmouth Kings are not so scary; in fact, aside from their photos and their habit of spelling everything with "k"s like the creators of the Mortal Kombat games, they're rather friendly. They've cultivated a laidback California (whoops, that should be "Kalifornia") lifestyle. They make life sound simple -- give the Kings something green to smoke and a place with some electricity, and they'll bring the beats and the microphones to rock the hell out of your party. If they gain a few pals along the way ("Friends"), that's cool, but as far as beef goes, if you don't mess with them, they won't mess with you. It's not surprising, then, that weed references dominate the tracks on Koast II Koast. Let's not kid ourselves, though. These songs aren't advocating medicinal use. The Kottonmouth Kings are more like the hosts at a party. And it all begins with the first song, "Where the Weed At" and keeps going until your stereo fills the room with aural ganja. One line in "Keep It Kali" goes, "When you need to get stoned, I'm your fix-it man". A line in "Neva Stop" says, "I got the kinda weed that'll leave you feelin' weightless". "Everybody Move" encourages everyone to "keep 'em up in the sky, if you like to get high", while "Koast II Koast" chronicles the love they've received from some Carolina fans -- a big bundle of good stuff to puff on. When Jeopardy's Alex Trebek says, "This song from the Kottonmouth Kings sounds similar to Cypress Hill," it'll be a snap for you to buzz in with, "What is 'Bong Toke'?" Let's not get the wrong idea, though. They might love the chronic, but the Kings do have other things on the tops of their domes. "Everybody Move" referred to "gettin' high", but the song also advocates "action", mostly in terms of taking steps to make changes in society. It's a clever tune, not only because it's danceable, but also because it sounds like it's about dancing and nothing else. It's not until you listen more closely that you realize these guys are interested in something serious. "Koast II Koast" is similar, but instead of promoting relatively friendly revolution, this song conveys the group's appreciation -- for their lifestyle, for their fans, and for their performances. Meanwhile, "Friends" hits all the usual high notes about what to look for in a homie (Will they be around when things get rough? Do their words match their actions? Are they only eyeing your riches? Will they really watch your back?). But the Kottonmouth Kings truly excel when it comes to producing beats and writing hooks. They've got their formula down perfectly, as evidenced by their signature Kali rhythms in "Where's the Weed At", "Keep It Kali", "Bong Toke", "Koast II Koast", and "Neva Stop". Elsewhere, "Irie Feeling" brings a reggae flavor, while "Do the Math" showcases a wall of sound that resembles old school Public Enemy. Two of the most quirky but catchy beats appear in "No Regrets" and "Hustle". Quite frankly, Kottonmouth Kings won't dazzle you with their word play or rhyme schemes or their ideology, but their beats will keep you entertained. In fact, the Kottonmouth Kings really don't have to say much over these beats if they don't want to. They could just cough or clear their throats to the rhythm and I think I'd still be like, "Hey, that's kinda tight right there". The Kings could probably teach a class in writing catchy hooks. They can guide eager rappers through the sonic landscape of layered vocals, chants, and partially sung harmonies. Of the album's 24 tracks, the 18 full songs are consistently enjoyable. The only possible exceptions might be "This My Club Song", a straight up party anthem, and "Smile", the Kings' attempt at a pop song. Neither one is that bad. "Smile", in particular, provides an interesting change of pace from the head nodders. All things considered, Koast II Koast should appeal to those who like West Coast boogie. Load this one on your iPod, lean back, and fire up the tunes.